SPRAYER DESCRIPTION: 5.6 Gallon Back Pack which features a quiet yet powerful gas powered motor making this one heavy duty sprayer! The motor is both easy to start and easy to maintain. It's a two stroke, which means it needs a gas/oil mix like common weed whackers, but with the right fuel mix the motor will burn cleanly and without a lot of smoke. If you need a powerful sprayer that enables you to apply material no matter where you are located, this is probably the sprayer for you. With it's triple piston/diaphragm pump and well built motor suspension system, this sprayer is both comfortable to use and powerful. Even when set to full throttle the sprayer performs smoothly and effortlessly. 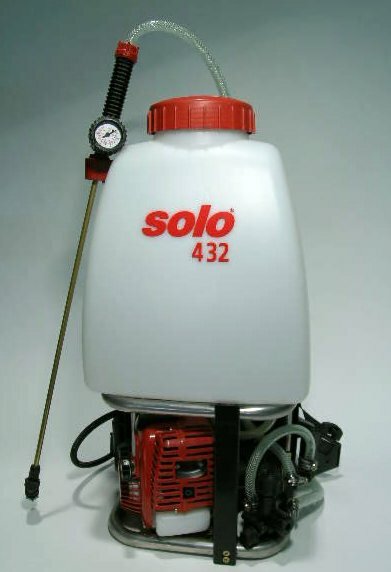 It comes with all the needed heavy duty options found on our other Solo Sprayers including a pressure gauge and fully adjustable brass nozzle. The motor is controlled via a throttle slide switch so you can turn it up or down as needed. It has a quick on/off kill switch and the shoulder straps are very comfortable – even with the tank fully fulled. 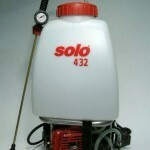 If you need a hard working sprayer that comes ready to work regardless of the location, you need this sprayer.